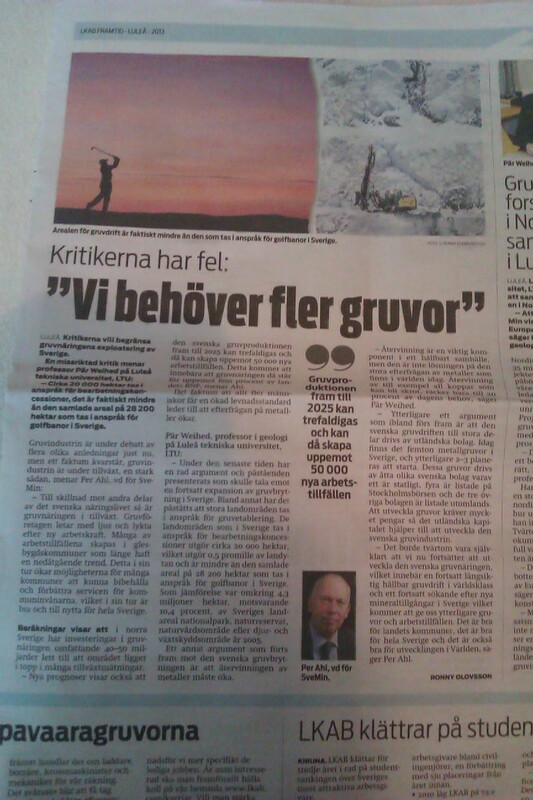 In a small newspaper named LKAB Framtid Luleå [LKAB Future Luleå] with a special February issue this year published by the Swedish mining company Loussavaara Kirunavaara Aktiebolag (LKAB), can an article with the headline “Critics are wrong: ‘We need more mines'” be found. That issue was a special one for the town of Luleå that is located by the Gulf of Botnia in the north of Sweden. LKAB is short for the mining company Luossavaara Kirunavaara AB and has its headquarters in Luleå, even though the company’s mines are located in Kiruna and Gällivare in the northwest of Sweden, a few hours car drive or bus journey from Luleå. The ore from Kiruna and Gällivare-Malmberget mines are transported by train to Luleå’s big steel refinery, and is from there shipped out either out into the world or transported to the another refinery in Borlänge in mid of Sweden. Much ore is also transported by train to Narvik and from there shipped all over the world. Interviewed for the newspiece “Critics are wrong […]” was director for SveMin Per Ahl, and professor in geology at Luleå University of Technology, Pär Weihed. In the article Weihed lists arguments that can be called pro mining ones: critics claim that the mining expansions take up too much grounds even if they are not according to Weihed, the recycling of metals is said to be sufficient even if it is not and therefore is mining for ore necessary, and the criticism that foreign mining companies will take mining money abroad is not a threat means Wihed since just a few mining companies are foreign. Since this is a blog text and therefore should not be too long, I think, this text will circle more closely around one of the three contested arguments; that only a few mining companies in Sweden are foreign ones. It says in article that there are 15 metal mines in Sweden and that two-three more are planned. Eight are Swedish, four are listed on the Stockholm share market and the other three are listed abroad. After a scrutiny of both exploration permits and concession licences just for the county of Norrbotten in northernmost Sweden, and where LKAB has its mines, can that picture be slightly expanded, if not altered. But first a short explanation what the two permits are all about. An exploration permit gives a mining- and/or prospecting company the right to look for minerals and stones on a specific ground; a permit which often includes digging test-drenches and/or drilling test-holes. Such a permit is sometimes called prospecting permit. A concession licence is the step after the exploration permit, and it gives its holder right to open a full-scale mine whether it is an underground or an open-cast one. Every mine active in Sweden is running because the company has a valid concession licence for each and every mine. Concession licences are given for 25 years at a time. After that are the concession licences automatically renewed for ten years at a time, if the company that has the permit does not apply for a shorter period of time to run the mine at hand. On the list over existing numbers of concession licences for the county of Norrbotten are there three foreign mines: Avalon Minerals Viscaria, Northland Resources and Norrliden Mining. Here is the number the same as the one Weihed presented. But the three companies hold together six concession licences. Since a, as in one, concession licence often is given for a, as in one, mine can that mean that three companies together hold licences to open six mines. And all concession licences are not a question of automatically renewals of old ones, since mining companies such as Northland Resources is new within the mining industry in Sweden. Northland holds three concession licences out of the six. The two Swedish based mining companies LKAB and Boliden have 14 plus 11 concession licences. So there are 31 valid licences that give the holders permission to mine in Norrbotten. The oldest one for the county of Norrbotten dates back to 1995 for a Boliden owned mine. A main part of those mines are on reindeer herding grounds with free-grazing reindeers. To the numbers of concession licences can the exploration permits be added. 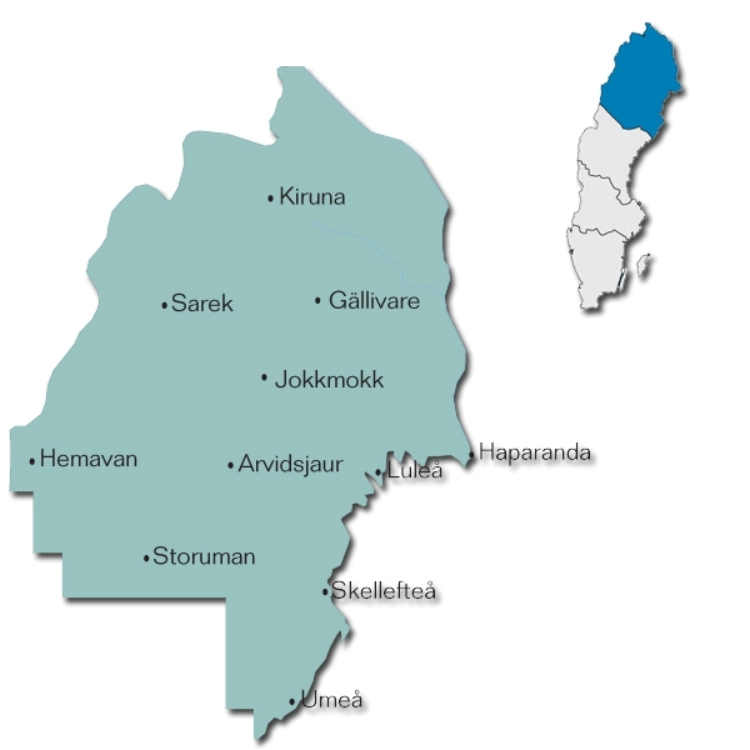 For the county Norrbotten there are 269. Approximate one third of those permits are in the hands of foreign prospecting- and/or mining companies. For the county of Västerbotten, the county south of Norrbotten, is the number of exploration permits 273 and concessions licences 69 – the latter ones mainly held by the Swedish mining company Boliden. Still; six plus 69 licences is 75. There are 75 concession licences for the north of Sweden. Even though some of them might be renewal of old ones, is that number remarkable high. According to Weihed are there 15 metal mines running in Sweden, without him specifying where those mines are located. Ahl, the director for SveMin, says that the Swedish mine production will most likely be tripled within 2025 and create 50.000 new jobs. This leads back to the question on how large areas mining is occupying – or an even more interesting question: how large areas will a mining industry that can produce 50.000 jobs occupy? Even if those 50.000 jobs will not all be within the direct mining, but also includes desk-work, must the areas for mines be larger than the ones today. But how much larger than today? As a ‘footnote’ to the issue of foreign mines is it worth mentioning that the owner-structure can sometimes be difficult to figure out when verifying whether there are Swedish based or foreign based companies operating in Sweden. Norrliden Mining can for instance be found on the webpage of Kopparberg Minerals that is a Swedish based company, but is to 50% owned by Gold Ore Resources Ltd. that in May 2012 merged with Elgin Mining Inc. which is a Canadian based mining company. Eling Mining Inc. has also interests in Björkdal Gold Mine in Sweden as well as Lupin gold mine that is located in Nunavut in north-eastern Canada. Weihed’s standpoint and arguments was later on reproduced by the newspaper Norrländska Socialdemokraten that is published in and with most of its readers in the county of Norrbotten. Conclusively, it can be said that each side of a matter usually has its perspectives, but as many as possible is benefiting from being discussed. LKAB Framtid Luleå 2013, no. 1, 2013, p. 5. Note: NOT available on-line. Just LKAB Framtid can be downloaded from the Internet. This entry was posted in All, Extractive Industries, Fennoscandia, Indigenous Peoples, Sámi and tagged metal mines, mining companies. Bookmark the permalink. Thank you for sharing this extensive material. Yes, while the mining industry operates globally, research on mining and its impacts is still too provincial. This is why we hardly know in Finland what’s going on in Sweden, and Canadians impacted by their mines in the Arctic know little about the experience encountered in Lapland. Therefore you do a great service by sharing this material.